August 5 – 8, 2017, in Jizan, our company engineering team carried out the commissioning and start up of the CMM-2,2 unit. 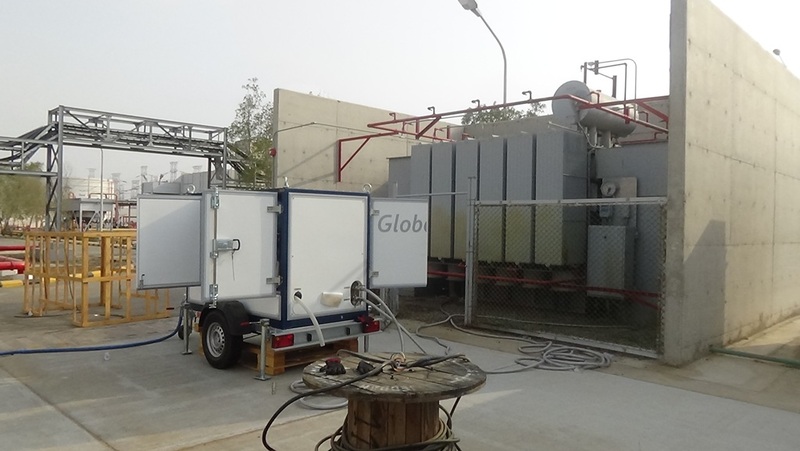 This unit added to the list of equipment already provided and commissioned for the electricity industry of Saudi Arabia by GlobeCore. The CMM-2,2 unit operates is several modes, and can be used for cleaning insulating oils from mechanical impurities, water and gases, and heating electric devices with hot oil, as well as vacuum drying of power transformers. In drying and filtration mode, the unit’s capacity is 2.2 m3 / h, and in degassing – 1.5 m3 / h.
Multiple passage of oil through a CMM-2,2 unit provides oil parameters of: total gas content below 0.5% (at the initial 10.5%) and mass moisture content below 10 g / t (at the initial 50 g / t). The equipment s containerized and is mounted on a single axle trailer, which enables movement between transformers and electrical substations. To receive consultation and to order a СММ-2,2 unit , please contact our managers on contacts link.